It was announced today that one of Heinz’s top selling products, and one of the nation’s more popular condiments for chips, sandwiches, salad and crisps, may undergo a total rebrand come September. ‘Salad Cream’ is considering a name change to ‘Sandwich Cream’ due to its popularity among sandwich eaters. Within the office at Pic HQ, we have fond childhood memories of our mother’s making Salad Cream and egg or tuna sandwiches (the mayo nemesis in this instance) and some of us even dip our chips or crisps in the stuff. In fact, using Salad Cream on an actual salad seems a bit of a rarity these days, which only highlights further the lack of Salad Cream being used for its desired purpose. In fact, only 14% of Salad Cream fans use it on a salad, so it’s totally understandable for Heinz to air its concerns over the product name. As a nation of all things British and Heinz; the people took to Twitter to voice their opinions. Of which, some suggested calling Salad Cream “white Ketchup” as it is in fact used for many other things than just sandwiches – such as the aforementioned delicious Salad Cream and egg sarnies (if you haven’t tried it, give it a go for tomorrow’s lunch!). Others suggest “if it ain’t broke, don’t fix it” as it’s been known as Salad Cream for 140+ years (wow! ), so why change an old favourite? Plus, where does it end? Will Ketchup become ‘Chip Dip’? BBQ sauce is hardly ever used for an actual BBQ, with many favouring it over mayo or ketchup for their chips, sandwiches and salads throughout the year. (Furthermore; when is the weather sunny enough for regular BBQs and subsequent need for the accompanying sauce?!) And what about the flop of ‘Burger Sauce’? Are Baked Beans obsolete because nobody bakes with them?! I’d also like to ask the angry condiment crew when they last bought a bottle of Salad Cream? Clearly sales are dwindling of the once popular sauce (cream? ), so why does everyone suddenly have such a strong opinion on the matter? And perhaps it’s been doomed for years… Remember this bizarre advertising campaign from 2000? 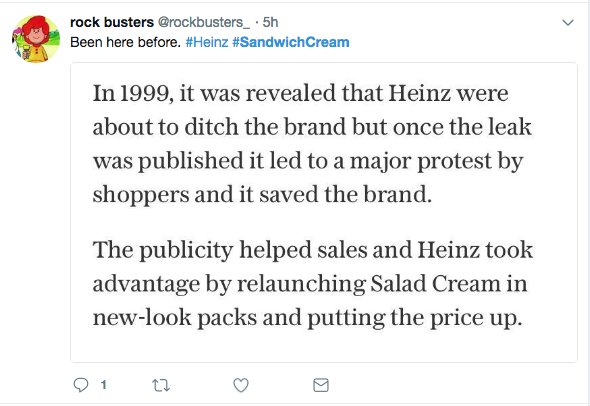 – this was a result of Heinz announcing, in 1999, that they were going to ditch Salad Cream altogether. Due to the information being leaked it led to a massive protest which saved the brand! Regardless of whether the name change goes ahead or not, at the very least this is a very successful PR ploy – and I’m fairly sure it is all a big PR push with the dream of being more successful than the early millennium. The topic has divided the nation and got people talking (again), undoubtedly boosting sales but mostly reminding us of the existence of Salad Cream.